The company offers its ZeroLeak Neldisc butterfly valve which provides bubble-tight shut off along with the long-lasting, dependable performance associated with true metal-seated discs. The company offers its ZeroLeak Neldisc butterfly valve which provides bubble-tight shut off along with the long-lasting, dependable performance associated with true metal-seated discs. In addition, lower operating torque, compared to competitive bubble-tight shut-off designs, allows for the use of smaller actuators. Microscopic surface defects on the valve's hard faced metal-to-metal seats are impregnated with a polymer. This allows long lasting bubble-tight shut off in a wide range of temperature ranging from cryogenic to +320°C (+608°F). In the company's laboratory, the ZeroLeak design has been tested for tens of thousands of cycles while maintaining its excellent sealing characteristics. This translates into years of leak-free operation in typical operating conditions. Minimized friction on sliding surfaces reduces the breaking force and operating torque of the valve by as much as 50% compared to other metal seated butterfly valves. This makes it possible to significantly reduce valve package costs by specifying a smaller actuator and supporting structures. The valves are fire safe. In the event of a serious fire, the valve will maintain a dependable ANSI Classs 5 (ISO 5208 Rate D) shut off associated with standard metal seat designs. Like all Neldisc products, ZeroLeak valves are designed for easy maintenance and fast, easy seat replacements. 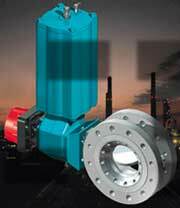 Existing Neldisc valves can be upgraded by installing ZeroLeak seats in the field. ZeroLeak high-performance butterfly valves are identical in geometry to the extremely reliable Neldisc valves, which have been proven over the years in both modulating control and shut-off services. A rugged, one-piece body and floating seat design ensure valve performance is unaffected by pipeline force or thermal fluctuation. The unique geometry provides machanically induced sealing, which is not dependent on differential pressure, and ensures excellent bi-directional tightness at very low-pressure differentials. The all-metal, one-piece floating seat does not rely on additional laminated components for sealing and is, therefore, no sensitive to temperature changes, dirty operating media or high velocity flows. This provides superior performance over long periods of time without maintenance, even in the most demanding applications. Neles Automation, Process and Energy Business Unit, Tulppatie 1, PO Box 310, FIN-00811 Helsinki, Finland. Tel: 358 20 483 150; Fax: 358 20 483 151.